Last night I dreamed I was looking for black socks. All night, I was looking all over for black socks. Finally, about time to wake up, I remembered I had half a dozen pairs in my drawer that I never wear. This is one of those days where I had something I was planning on posting about but can’t remember now. Kind of like when you have a list of movies you want to see and can’t remember a single one when you go into the movie rental place. Ha, funny what we dream about, isn't it? Anything from the bland to the ridiculous can pop up. Cool black socks (wink). That happens to me all the time…. 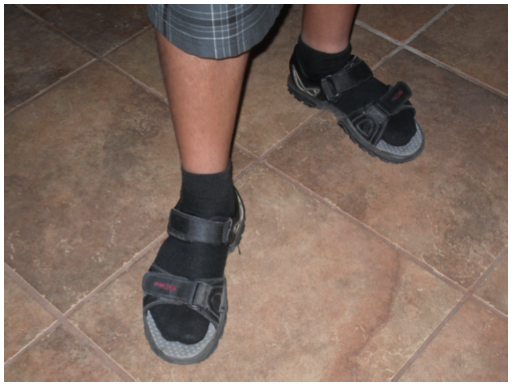 you wear socks with your sandals?…Geek! I wish some of my customers would wear socks with their sandals ….only cause their toenails are gross …they look like dirty fritos! Ick! I have a drawer full of white socks. Need any of those? I'm happy to read that those are NOT your socks, otherwise, I'd say you need to put them back in your dream drawer!